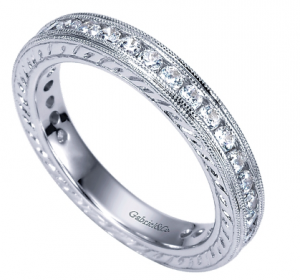 Diamond wedding bands are typically classic and demure compared to the flashy engagement ring. We can help you find the perfect wedding band to compliment your engagement ring style. Wedding rings can be as simple as a plain metal band (gold, white gold, platinum, rose gold). However, to add some sparkle adding small diamonds is a nice choice. Additionally, you can choose to have something delicate or something a little more substantial with intricate details including multiple rows of pave diamonds and eternity symbols.